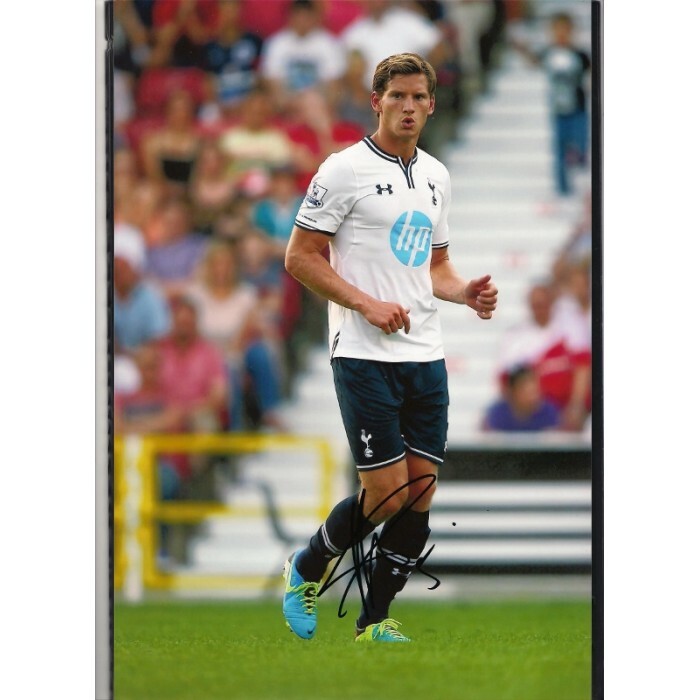 SALE: Signed photo of Jan Vertonghen the Tottenham Hotspur footballer. Home » SALE: Signed photo of Jan Vertonghen the Tottenham Hotspur footballer. Jan Vertonghen. This is a really fabulous approx. 8 x 12 (20 x 30) colour photograph of Jan Vertonghen the Tottenham Hotspur footballer. This photo shows Jan Vertonghen celebrating yet another goal! The quality of this photo is just terrific. Jan Vertonghen has signed this photo using a fine black marker pen. Jan Vertonghen has played 57 leagues games for Spurs since he joined them in 2012, scoring 8 goals. Jan Vertonghen has also won 56 full caps for Belguim. Jan Vertonghen has played for Belguim in the 2014 World Cup Finals in Brazil. This really is a nice collector piece and very reasonably priced at £9.99.